SiriusXM has announced that iconic guitarist, songwriter, vocalist and three-time Grammy-Award winner Brian Setzer and his 19-piece The Brian Setzer Orchestra will perform a special invitation-only show for SiriusXM, for the third consecutive year, on Tuesday, December 19 at the Troubadour in Los Angeles. 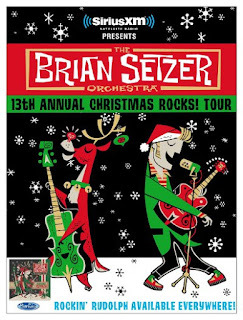 The exclusive performance for SiriusXM will feature The Brian Setzer Orchestra performing their unique take on Holiday classics, including songs from their Christmas album, 2015’s Rockin’ Rudolph, as well as Setzer’s well-known hits from the Stray Cats and his solo career. The “Christmas Rocks!” concert, taking place at the Troubadour in Los Angeles, will air Friday, December 22 at 8:00 pm ET on Outlaw Country, channel 60, and through the SiriusXM app on smartphones and other connected devices, as well as online at http://www.siriusxm.com. Additionally, the concert will air on Friday, December 22 at 10:00 PM ET on SiriusXM’s Holly, channel 70. The Brian Setzer Orchestra’s 14th annual “Christmas Rocks! Tour,” is presented for the second consecutive year by SiriusXM, which concludes in Bellingham, WA on Thursday, December 28. Created and executive produced by Stevie Van Zandt, Outlaw Country plays country rebels like Johnny Cash, Waylon Jennings, Willie Nelson, Dwight Yoakam, Emmylou Harris, Lucinda Williams, Sturgill Simpson and Jason Isbell, and features shows hosted by Steve Earle, Buddy Miller & Jim Lauderdale, Mojo Nixon, Shooter Jennings, Johnny Knoxville & Roger Alan Wade, Hillbilly Jim, and Paula Nelson.